SYLRA 2019 – Registration, before April 29th, 2019. & 1st YL group to activate lighthouse in South American weekend event. 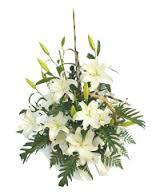 Our condolences to Om ZS6GBJ Rene, daughter ZR6GAG Gaelle, Gwendolyne, grandchildren, family and friends.. The Icom Excellence Award. This award is bestowed annually by Council on the SARL member who through his/her activity in the Amateur Radio Service has brought international recognition to South Africa by either the achievement of a VHF/UHF long distance record which is internationally recognized by the IARU, or by service to the Republic of South Africa or the SARL in the field of scientific research using the amateur spectrum, or in promoting the amateur service internationally or as Council may determine from time to time. Sid and Adele Tyler, ZS5AYC and ZS5APT - they mapped Namibia's summits so that Namibia is now also on the SOTA database. The AKYAB Trophy. 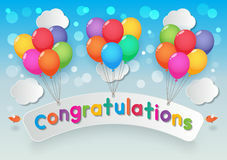 Awarded by the Contest Committee to the SARL member who, in his/her first year of licensed activity, achieves the highest score during the annual HF Phone Contest. The SAWRC Trophy. Awarded by the Contest Committee to the YL SARL member amateur who achieved the highest aggregate score in the three annual South African Radio League HF Contests. SARL Certificate of Recognition Heather Holland ZS5YH / ZS6YE for her contribution in promoting women in amateur radio with the monthly newsletter YL Beam and the regular posting of interesting items on the SA Radio League Facebook page. SARL Certificate of Recognition For the 2 metre FM QSOs between ZS1/ZS3 and St Helena Island (amongst others) made by Michelle van der Merwe, ZS3TO and her OM Kobus van der Merwe, ZS3JPY. DL7DF.com ... Gambia between April 1 and 15, 2019. We will be active with three stations from 160m through 10m on CW, SSB and Digi modes. 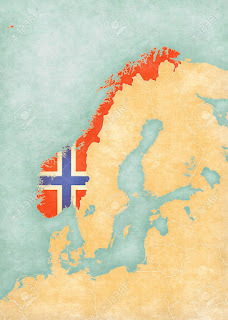 SYLRA Sept. 2019 Norway meet – Registration, before April 29th, 2019. Summer is getting nearer and the SYLRA meeting at Lillestrøm, September 5th to 8th, 2019. For those who have not visited our website https://la.sylra.is/ lately, the registration for the SYLRA meeting is open and we hope many of you out there will take this opportunity to participate in this YL meeting. Experience a long weekend with ham radio, a border station which no country in the world has; enjoy, see and hear about Norway’s heritage at its original place; and last but not least, meet other YLs. If you are thinking of joining us, please go to our webpage https://la.sylra.is/ and register before April 29th, 2019. We hope to see you at the SYLRA meeting at Lillestrøm in September. 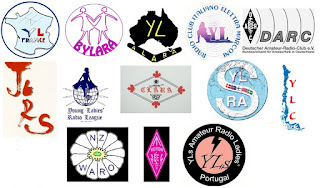 The British Young Ladies Amateur Radio Association (BYLARA) was founded in April 1979. To commemorate this special birthday, we are running our GB40BYL Special Event callsign throughout our 40th year, along with an award scheme to encourage you to not only work the GB40BYL call from various locations around the United Kingdom, but also with the added challenge for you to work as many YLs as possible within 2019. The YLs who take part do not need to be BYLARA members and can be anywhere in the world. BYLARA members will be active throughout the year to promote this award. Please listen out for us and ask for our BYLARA Membership numbers. Visit our website for details, of the various activity days as well as both our Facebook Group and BYLARA Reflector on the groups.io website To get started, download our tracker on our website at http://bylara.org.uk/awards2/bylara-40th-anniversary-award/ Cost is Free. 27th-28th April 2019 BYLARA meet at Blackpool, to celebrate '40' th on 29th April 2019. GRUPO YL ZONA NORTE DE CHILE - FARO HUASCO CHI-081. Congratulations to Maritza CE1RFI, Delcy CE1RFN, Rosita CE1WZM, Norma CA1NCQ, Marcia CA2BRJ and Ely CA2MEM, for accepting the challenge of putting FARO HUASCO CHI-081 on the air. They are the first YL group of operators to activate a lighthouse in the annual South American weekend event. They are congratulated on their effort and the many qso's made. a) The Ethel Smith, K4LMB, Memorial Scholarship which pays $2,000. b) The Mary Lou Brown, NM7N, Memorial Scholarship which pays $2,000. c) The Martha “Marte” Wessel, K0EPE, Memorial Scholarship which pays $1,000. Applicants must be female and hold at least an FCC Technician Class or equivalent foreign authorization and intend to seek a Bachelor’s or Graduate degree from a U.S. college or university. The cut–off date for applications is April 30. Please publish it to your organization and anywhere else you feel might reach prospective applicants. 2019 Scholarship Application Forms can also be accessed at www.farweb.org. ADL 111 at Girls Day April 25,2019 - 000900 LT to about 1500 LT QRV. Daughters Day is again on April 25th and the ADL 111 is back with the daughters of the employees of A1 Telekom. 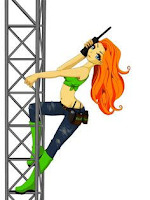 Organized from the company headquarters in Vienna and, a program that will delight the girls using wireless technology and making countless nice QSOs on the surrounding relays. Also short wave and echolink will be in use. We ask the YLs and OMs in the area of Vienna to be particularly active on this day, and to listen for the voices of the girls. For the ADL 111 - OE3KJN Dipl.-Ing Herbert Koblmiller; a HAM-Radio Club, founded by employee of A1 Austria Telekom.located at technology center of our Company in Vienna. in Allentsteig, Waldviertel. There are already YL meetings in many countries. That's why we try to organize the YL team of the AMRS-Waldviertel in Austria. So girls, pack your bags and om's together and take a few days of vacation, which includes the radio, and join us in the beautiful waldviertel (forest). Vy 33 + 73 de Marion oe3ysc, YL speaker of the AMRS. General: The meeting will take place at the leisure centre in Allentsteig. Allentsteig is located in lower Austria in the middle of the beautiful Waldviertel. The Lake is also used as a pond and is located in a quiet location on the outskirts of the city At The Leisure Centre there is a cosy barbecue area with a BBQ, showers, toilets and a limited number of outdoor swimming pools. Accomodation available in and around Allentsteig. There is also enough space for our radio activities. We are waiting for you from 9 pm at the leisure centre allentsteig and are looking forward to a welcome chat with you! At noon there are various home made breads and in the afternoon coffee and cake will be provided. 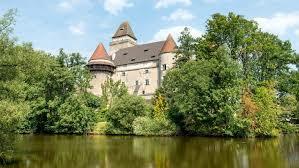 In the late afternoon, we go to the 30 km away castle heidenreichstein and take a walk through the wasserburg. Then a cozy end at dinner in the tavern scribe. It's going back from 9 PM. At noon there are various types of sausages from the tripod boiler. In the afternoon, interested people can participate with Heike Dl3hd, on a project (solarleuchte from a jar). Also, of course, there's coffee and cake again. In the evening we spoil you with treats from the grill with subsequent cozy round at the bonfire. We would be very happy to see you again. Getting to know in a nice and cozy meeting!!! Heidenreichstein Castle a colossal building situated in the moorlands to the northwest of the Waldviertel is the largest and best preserved medieval water castle in Lower Austria. Surrounded by a moat, it has never been in enemy hands since its construction at the end of the 12th century. Amateur radio magazine CQ ham radio (Japan) introduces a new series that began with the January 2019 issue. "Enjoy like me! Active female ham communication"
In this series we will take up a topic that may be of interest to women enjoying amateur radio. We establish a place of information and exchange between women hams! In conjunction with this series, we have launched a group on facebook, ( https://www.facebook.com/groups/CQylham/ ). 27-28 April BYLARA meet at Blackpool, celebrates '40' on 29th April 2019. Yes! Finally a Geo-stationary Amateur Radio Satellite. "The repeater was engineered with two main services in mind. The first is a narrowband transponder intended for phone (voice) contacts, continuous wave (CW) for Morse contacts, and some of the narrow bandwidth digital modes, like PSK-31. The other transponder is for wideband use, intended to test Digital Amateur Television (DATV). The wideband transponder can carry two simultaneous HD signals and a beacon broadcasting video content from QARS. Both transponders uplink on the portion of the 2.4-GHz reserved for hams, while downlinking on the 10.4-GHz band." USA Amateurs need not apply...HI! "But for hams anywhere from coastal Brazil to Thailand, the satellite is visible 24 hours a day. The equipment to use it can be a bit daunting, if the experience of this amateur radio club in Norway is any indication. They used a 3-metre dish for the 2.4-GHz uplink, along with a string of homebrew hardware and a lot of determination to pull off their one contact so far, and this from a team used to bouncing signals off the Moon." Neli Pantsutaia van Denemarke het 'n versoek gerig aan alle Jong Dames wat Radio Amateurs is, om 'n vir haar 'n opname te stuur wat sy kan gebruik gedurende 'n fees by die Royal Danish Academy of Music. Hierdie gebeurtenis vind plaas op 9 Maart 2019, wat ook die dag is na Wêreld Vroue dag. Die opname is baie eenvoudig, al wat jy moet doen is om CQ CQ CQ te roep jou roepsein te gee en jou naam. Hallo Jong Dames daar buite. Ons is nog steeds op soek na Jong Dames se roepseine van die wêreld. Kan jy ons nog help? Asseblief ons benodig dit so gou as moontlik. Die komponis Neli Pantsutaia doen 'n projek "Vroulike stemme van die wêreld" en wil graag die vroulike radio-amateurs se stemme in sluit in haar projek. Hierdie projek is enig in sy soort en het belangstelling gewek by menige Jong Dames reg oor die wêreld. Neli Pantsutaia has requested that all young ladies who are radio amateurs to send a recording of their voices that she will use in a composition for the Royal Danish Academy of Music festival. This event will take place on 9 March 2019, the day after World Woman’s Day. The recording is simple, all you need to do is to call CQ CQ CQ, your callsign and your name. Hello YLs, out there. We are still hunting for YLs call signs from the world? Can you still help us? Please! We need it as quickly as possible. The composer Neli Pantsutaia will make a Piece "Female voices of the world" and like to include female radio amateurs' voices in her composition. She needs, “CQ CQ CQ, your call sign your call sign and your name” eg “CQ CQ CQ ZR6D ZR6D Anette” and then send it to Neli at neli.pantsulaia@tsc.edu.ge or to 0045 91564744. The piece will be performed live by Petra Larson, OZ7PR and Inger Lundin, OZ7AGR (both from Denmark). Lots of thanks. 33 de Inger Lundin OZ7AGR. S/K	KI6PDY	JoAnne Benson	SK January 4, 2019. Licenced in 1975, Kentucky, Past President of TASYLs (The Auto State YL Society) and vice- president of the Central Michigan Area Repeater Association. Dad was an amateur radio operator (HAM) and somewhere along the way, maybe just to prove she could, she learned Morse code at 5 words per minute and taught herself all of the technical stuff and passed the exam to get her first HAM license. Never being satisfied, she improved her Morse code speed to 7 and then 12 words per minute and learned even more technical "stuff", took the exams and got the next two higher categories of licenses. She loved talking to people on the radio and made friends around the world and actually travelled to visit some of them. She was an active member of Young Ladies Radio League and served in several different leadership positions with them. We hope for your numerous participation! Maybe this year even more European YL stations qrv? while participants from other countries shall send their log to Sophie, F4DHQ (f4dhq@orange.fr). Send log to Heike DL3HD dl3hd@darc.de by the end of March. is a famous traditional girls' festival on March 3, in Japan, to celebrate the birth of a girl and to wish her future happiness. A set of dolls in ancient costumes are displayed in a girl's house. Exchange is a RS report; and YL or OM. Scoring: YL/ YL stations 5 points. OM / OM stations 1 point. In 1977, the UN assembly decreed International Women's Day on March 8 of each year. This date was established because of the struggle of women in society and their full development as a person. For this reason, Radio Club YL CHILE has planned a contest for Saturday 9 and Sunday 10 March. Comienzo: Sábado 9 de marzo 2019, a las 13 Hrs. UTC (10:00 hrs. de Chile). Finalizando el Domingo 10 de marzo 2019, a las 22 Hrs. UTC (19:00 hrs. de Chile). We invite all Amateur Radio ladies to participate and celebrate this special day. Join this 'on-air Argentinian party' to celebrate the INTERNATIONAL DAY OF THE WOMAN. If using systems such as Echolink, clarify the system used in QSL confirmation. Almost one year ago we turned the month of March into ‘our month’, as we launched our Dutch YL-award. We made a lot of long distance radio contacts with radio amateurs all across the globe. This year we will celebrate International Women’s Day, by organising “Ladies Night at PI4AA”. Through their radio contacts radio-amateurs make friends far off. Sometimes these contacts lead to something special. Today, a big envelope arrived, covered in strange signs and exotic stamps. Inside, a Japanese magazine for radio amateurs: the ‘CQ Ham radio’ accompanied by a 50MHz special. Somewhere in the middle of the magazine one finds an article about the Dutch YL-award. In Japanese, of course. PI4YLC active in the Russian DX contest. the Dutch Young Ladies Club contest team joined the Russian DX contest (RDXC) for the 6th time. Since a YL-operator team participated at the SP-DX contest in 2012, the team has grown every year and now consists of eleven Young Ladies. The YLs live every where in the country (and just across the border in Germany), it is a challenge to have everyone present at the same time. That is why it is extra special to have PI4YLC participate in the contest with nine (!) YL-operators. OM Raymond PA5DX helped us with the set-up. On the 8th of March it is International Women's Day and that is why last year we named the month of March 'our' month with a YL-award. 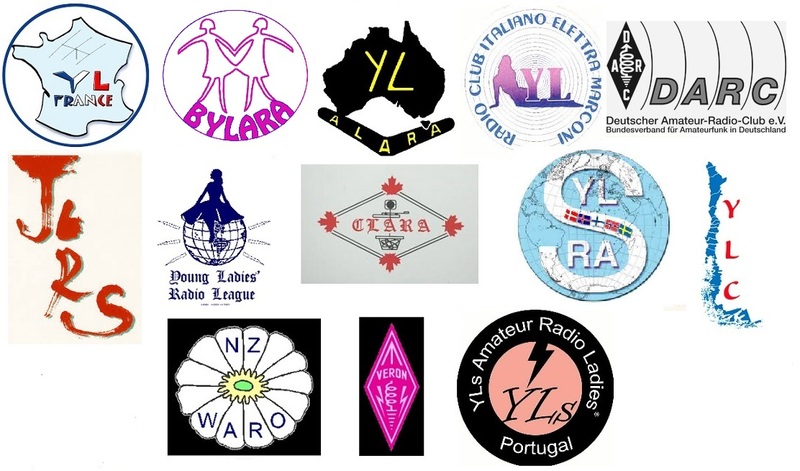 This year we are going to do something different to bring attention in March for the YLs in the radio hobby: a Ladies Night at PI4AA on Friday, March 1st. Because Emmie PA1EM, Mariëtte PA1ENG and Heather PD3GVQ are already connected to the editors of PI4AA, the intention is that they will be the presenters during the broadcast. The editorial staff will take care of the copy and editing. The attendance call-in after the broadcast will be provided by operators from the PI4YLC contest team. Accommodation QTH: Hotel Valeč, (near Třebíč), Vysočina Region. I accept registrations with pleasure at hb9fpm@uska.ch (Eva Thiemann, HB9FPM / OK3QE). Třebíč is the third most important town in Moravia, in the Vysočina Region of the Czech Republic; 35 km southeast of Jihlava and 65 km west of Brno. The historical town of Trebic, which extends on both sides of the river Jihlava, was declared a Conservation Area in 1990. The Jewish Quarter and St. Procopius Basilica are listed as a UNESCO World Heritage Site. There are two train stations serving the town: Třebíč and Třebíč-Borovina and the bus station is in the center, only few steps away from the bridge on Jihlava river. On Tuesday the 19th of March 2019, Princess Elettra Giovanelli, daughter of Marconi and her son Prince Gugielmo Marconi will visit the former site of the Marconi Radio Station on the 100 year anniversary of the first spoken word from East to West from the Radio Station to Cape Breton, Nova Scotia Canada. In the afternoon they will unveil a commemorative plaque to this historic occasion in Ballybunion. All are welcome to attend. 2019 the Special Event Call EI-100-YXQ will be on air to commemorate the 100th Anniversary of the historic event, of the fist East to West voice transmissions across the Atlantic from the former Marconi radio station in Ballybunion, Co Kerry, Ireland. 19th March 2019 is the anniversary date, and on this day, KARG and others will be QRV from the site of the former Marconi radio station on all band, all modes. 5 March AGCW YL-CW Party (Activity Group CW) 1st Tuesday, March 1900 - 2100 UTC. 9 -10 March :YL CHILE Sábado 9 - 1300 Hrs. UTC (10:00 hrs Chile). Domingo 10 a las 22 00Hrs. UTC (19:00 hrs. Chile). 23-24 March CLARA Chatter Party 23 March 1700Z - 24 March 1700Z Total equal 24 hours. 30 March Earth Hour 2019, switch off your lights from 8:30 pm to 9:30 pm. At the Kempton Park Amateur Radio Technical Society AGM 8 April 2017, Mary ZS6AKR – was awarded 'News reader of the year' and Mary ZS6AKR and OM John ZS6JRH received Honorary Life Memberships for the support and commitment shown to the club. Mary was a great supporter of all YL events. She leaves a big hole in our radio community. It is very sad to inform that Ms.M.Bhanumathy VU2BL of Secunderabad, India, breathed her last on 15.01.2019. She has been a constant source of inspiration and support for everyone at NIAR (National Institute of Amateur Radio) for over 4 decades. She has dedicated her services for promotion of Amateur Radio after her retirement from HAL, Hyderabad. She has been the Governing Council member since its early days. Ms. Bhanumathy VU2BL, volunteered for emergency communications, dxpeditions, events, training programs or any event with her full support. She was very active on radio during contests and regularly inspiring budding hams to make their first radio contact. We are truly saddened to her the loss. We hope the family to gain the strength to bear the loss and wish the departed soul rest in peace. VU2MYH. Suri Ram Mohan. We were saddened to hear of the passing of Raija Ulin SM0HNV from Stockholm, Sweden. Raija made many trips ‘down under’ to attend ALARA Meets and I know she will be sadly missed by many. Our thoughts and sympathies go out to her family and friends. Raija joined ALARA in 1989 and was sponsored by Bev VK6DE. Many members who attended ALARAMeets from 1996 onwards would have met Raija, as she attended the ALARAMeets in Perth in 1996, (which Bev organised), Brisbane in 1999, Murray Bridge in 2002 and Mildura in 2005. We believe that she may also have been instrumental in starting the YL International Meets, which saw YLs travel to places in many parts of the world for the Meets. In 2011 one was held in Glenelg, South Australia, and following it, many of the participants travelled on the Ghan train to Alice Springs and Darwin. that she did lots of walking/running, etc in Sweden and the stairs were so easy for her. We then shared some bubbly at the winery”. January 7 , 2019 - YLRL is sad to hear of the passing of Betty Jo Byrd, KB5CSQ of Gulfport, MS. Betty Jo was a past District 5 Chair and had been a member of YLRL for the past 12 years. Her granddaughter Hailey Byrd is a current member of YLRL. Our sincere condolence to the Byrd family. Betty Jo Byrd (1954-2018) age 64, passed away on Thursday, December 6, 2018.
etty Jo Byrd, is president of SMYL and has been licensed since the 1980s. On the qrg 3,740 Mhz +/- qrm. I will take over the control center with the callsign oe3xrc. ALL YL's sincerely invited to join, I would be very happy for your numerous participation! SYLRA meeting, September 5 - 8, 2019; Oslo Norway All Yls are welcome to attend. The meeting is going to take place in the vicinity of Oslo. September 6th: Full day out in the field with radio activities, YL meeting. We will arrange light lunch, coffee breaks and dinner. The transport will be at our hotel after breakfast. September 7th: Half day sightseeing tour. Rest of the day for each one of you to do what you like. In the evening there will be a Gala dinner. Unni and I (Ingrid) will negotiate good accommodation prices for you at the location of the SYLRA meeting. We will put all Information on the SYLRA web page as soon as we get them. We should have them within end of January. We will inform you when the information is available on the web page and the registration is open. The registration form will be available on the web page. We apologise for any inconvenience these changes will cause you. Unni and I just wanted to give you all a new experience with the Hurtigruten tour. We hope to see as many of you as possible at the SYLRA meeting and hopefully more of you also on the optional tour. Please, send all your requests about this meeting to lullen55@gmail.com . 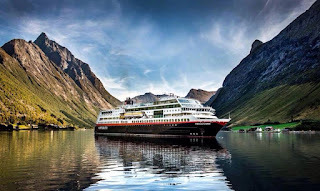 The tour with Hurtigruten will from now on be an optional tour to take after the SYLRA meeting, September 5th until September 8th, 2019. September 9th to 15th, 2019 - MS Trollfjord, sails from Bergen to Kirkenes, along coastline of Norway and across the Arctic circle. Those who are going to take the optional tour can stay in Oslo or go to Bergen. We will suggest that you go to Bergen on Sunday, stay over in Bergen one night and have a look at the city before going on board Hurtigruten Monday evening. 1. Thank those Hams that are mentors. 2. Encourage existing Hams to become mentors. so current operators will become interested in taking up the challenge. If this is something that you would like to participate in, please contact Anne, WB1ARU at wb1aru@gmail.com or through this group YL-Ops. YLRL District 5 meet up. We will set up radios and call CQ using the YLRL call sign K4LMB/5, in honour of the 80th anniversary of the club. Meet at Susan Heim Moody's (K5YNC): 857 Childress Rd Saint Jo, Texas 76265. Susan has 60 acres. Plenty of room for tents and RV's. If you are not the outdoor type, Saint Jo and Nocona have hotels. Susan runs a restaurant on the property called Ancient ovens. We can eat at her place or get something from town. Same weekend as Hamvention, (above) so YLs will try and make contact with K4LMB/5 Meetup from there. "FIN DE SEMANA DE LOS FAROS AMERICANOS"
August is mid-winter in the Southern hemisphere and in the southern-most regions of South America, harsh weather conditions, including gales and snow storms, sometimes make roads impassable and expedition destinations impossible to reach, especially if off-shore. The idea of activating a Southern Summer Lighthouse Weekend in February emerged. LU3DXG Radio Club Grupo DX Bahía Blanca (Argentina) organized the 1st South American Lighthouse Weekend in February 2009. The response was spectacular. In 2009, 52 Lighthouses from 6 countries, were 'on-air'. During the 10th annual event in 2018, there were 73 activations from 11 countries. 2018 - The 10th edition of the "American Lighthouse Weekend"
For the first time, Brazil carried out the greatest number of activations. Much had to do with the friend Orlando Perez Filho PT2OP, the only PY representative active in the ten events, who with his example motivated his Brazilian colleagues, who took the opportunity to put 28 lighthouses on the air. It is important to recognize the great physical and economic effort of the expeditionaries, since their generosity made this encounter possible. But it would be worthless if the other side had not been the "hunters" with the equipment switched on. The key to success was the combination of the activators on the one hand and lovers of the lighthouses on the other, since both parties are essential. The team of the Radio Club Grupo DX Bahía Blanca expressed their appreciation, expressing the hope that in 2019 we will all be together again. South Americas Lighthouse weekend "Fin de Semana de los Faros Americanos"
Punta Ninfas (Spanish, "Nymphs Point") in Chubut Province, Patagonia, Argentina. Part of a promontory into the Atlantic Ocean, which encloses one side of the Golfo Nuevo, with Península Valdés opposite, almost enclosing the circular gulf. 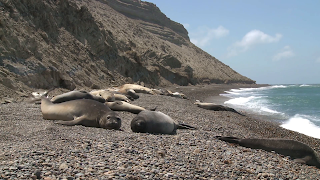 The Point is about 90 km southwest of Puerto Madryn, Patagonia, and about 1300 kms from Buenos Aires. 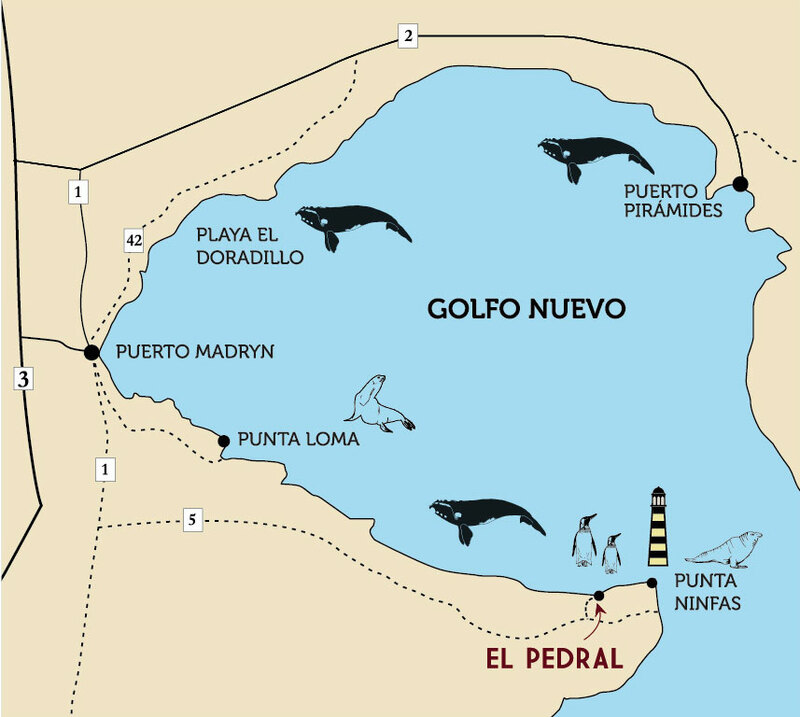 The southern end of Nuevo Gulf and the Punta Ninfas Lighthouse, are important landmarks for ships entering the gulf. It offers one of the most stunning panoramic views of the area, from which you can observe the sea meeting the land, the tides come and go; and watch for the first whales who arrive at the gulf every year, during the cold days of May. Punta Ninfas is a gravel beach, which extends over 9 km along the sea shore. It is a strange geographic formation, unique to the Patagonian coast, 900 metres wide and 8 metres deep. 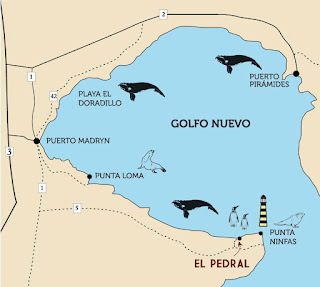 This is the beginning of the Golfo Nuevo (New Gulf). The lighthouse is situated at the Point, which is made up of high, bare cliffs. At the end of the road leading to the Punta Ninfas’ lighthouse, is a pathway down to the beach. Relentless strong wind makes scrambling along the cliffs and beaches difficult. The beaches at the foot of the cliffs, which go from the 'el pedra' until Punta Ninfas, are home to a colony of elephant seals, best viewed September to March; and the Magellanic penguin colony (Sep- April). The Committee of SARL has made some Calendar changes. 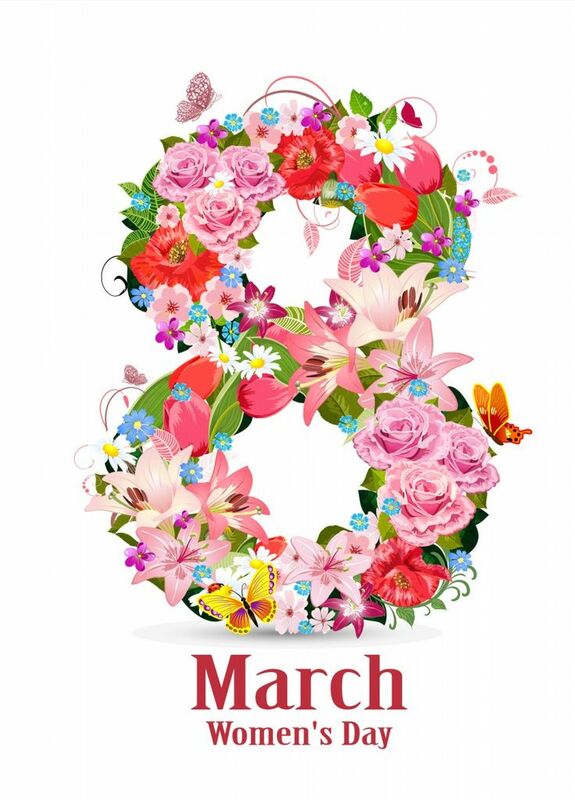 Each year on 8 March, the International Women’s Day is celebrated. From 2019, the first leg of the SARL YL Sprint will be run on Saturday 9 March. This will give the South African yls another opportunity to get-on-the-air! 8 - 9 Feb AstroFest 2019, Kensington Events Centre in London. 14.Feb Valentine Sprint PODXS 070 Club, PSK31, 40/80/160 m during a six hour block. 2 March, 2019 - 55th anniversary of RAST in Pathum Thani, Chao Phya River in Nonthaburi, north of Bangkok..
8 March International Women’s Day - Think equal, build smart, innovate for change”. Special YL-event OK5Z, Brno, Czech Republic. SYLRA meeting Norway 2019 cruise from Bergen to Kirkenes, September 9th to 15t. We finish 2018 with the 2yls in the Hall of fame and hope the quote below will inspire us to fly into 2019? My editor (the OM) complained that this issue“ reads like a calendar - no lady news!" so please share your news & views before he goes on strike (hihi) 73 from the OM & 33 from Eda ZS5YH. 19-20 Jan 2019 foundation World Castles Award program – on the 14th of January 2009. become a tradition and every year on the third weekend of January we work on the air from castles and fortresses. Quartzfest is a week long ARRL Specialty Operating Convention held FREE in the desert just south of Quartzsite Arizona the last full week of January every year. 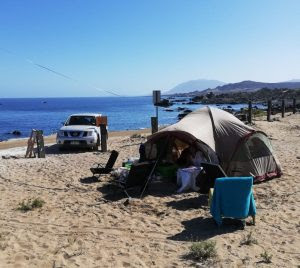 Quartzfest is an RV "Boondocking" (dry camping) event which features 8 seminars each day on a variety of topics including Amatur Radio, RV'ing and Alternative Energy. During February the 11th annual South Americas Lighthouse weekend will be held. This year there will be a YL team for us to support! 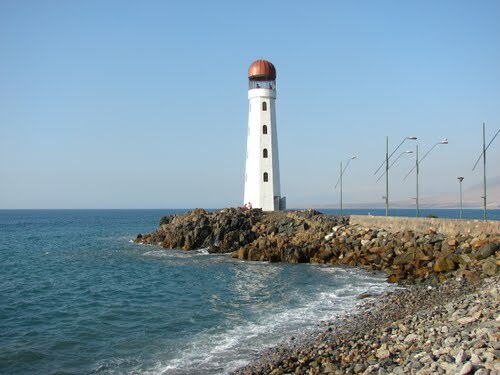 The Monumental Lighthouse of Huasco, is located in Punta Escorial, locally known as Puntilla, in the city of Huasco, in the Chilean region of Atacama. Its octagonal concrete structure of 22 meters, equivalent to 5 floors., together with the Parochial Church San Pedro Apóstol, it is a recognized symbol of the city, and Huasco district. after the successful YL activity 2018 on IOTA EU-064 (Ile de Noirmoutier) - we look forward seeing you at the next event in the Czech Republic. We use the first class contest station OK5Z for one week. The callsign OL88YL will also used to some SOTA (summits on the air) activities. The facility is located near Brno, the second largest city in the Czech Republic. The costs (without travel expenses) are per participant about 650 EUR (full board) for the week. The 4* hotel is about 12 km from the radio station. There is also a lot of emphasis on a comfortable and social get-together. There will be visits to cultural sites such as Prague during the radio activity week. On the further development of the event, we will update everyone through suitable media. Feel free to contact Eva Thiemann, HB9FPM/OK3QE for any questions. Brno is located in the southeastern part of the Czech Republic. Iin a beautiful natural environment between South Moravian vineyards and the Moravian Karst, and is an easy drive to the nearby Austrian border. Brno is the second largest city in the Czech Republic and often competes with Prague in prestige. Founded around the year 1000, the city has many historical attractions and is also a university city. Brno is an important stop on the Prague–Vienna and Prague–Bratislava–Budapest railway lines. SYLRA came together in Copenhagen 15th August 2003 to found the first joint YL organization. SYLRA membership is open to ALL YLs. 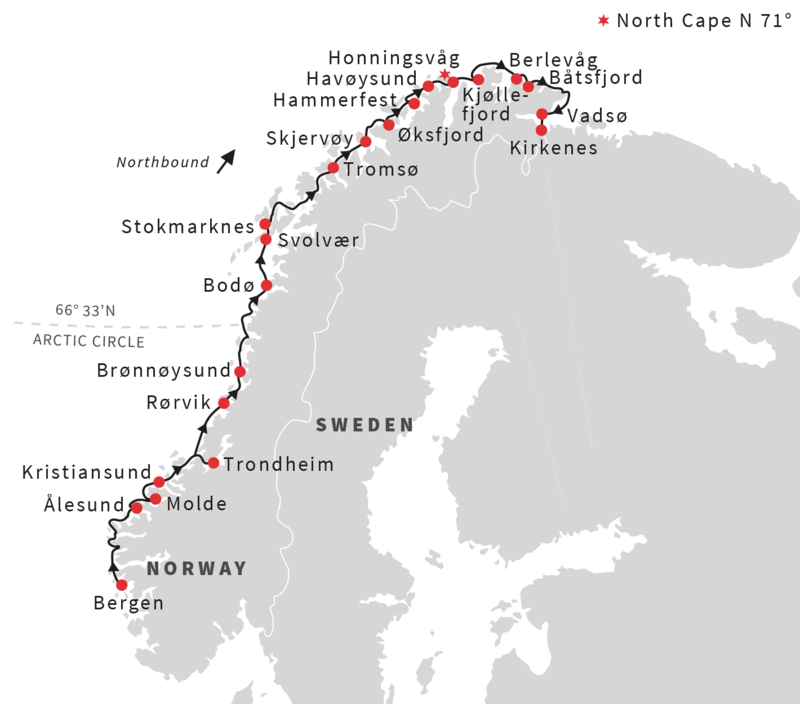 MS Trollfjord (above), from Bergen to Kirkenes (map below), September 9th to 15th, 2019. PS - SYLRA conference in Oslo just before the Hurtigruten trip, 5-8th of September, 2019. We have now the final prices for the above meeting on Hurtigruten’s, MS Trollfjord, from Bergen to Kirkenes, September 9th to 15th, 2019. The prices include: 6 breakfast; 5 lunch, 5x 3-courses dinner Gala dinner. OBS! All beverages are self-paid! We are sending you this e-mail now, because we need your feedback as soon as possible regarding your participation or not. This is due to limited inside and outside cabins. When we have received the feedback from you, a list of suggestions and prices for activities on this tour, will be sent you. NB: We need to hear from you within January 20th, 2019. STS-107 Columbia (January 16 to February 1, 2003). The 16-day flight was a dedicated science and research mission. Working 24 hours a day, in two alternating shifts, the crew successfully conducted approximately 80 experiments. The STS-107 mission ended abruptly on February 1, 2003 when Space Shuttle Columbia and the crew perished during entry, 16 minutes before scheduled landing.